If you’ve decided to buy a portable wash down system for your boat, RV, plane or auto you’ll be overwhelmed by the number of choices available. At last count we found seven companies offering horizontal PVC tubes as portable water softening systems. Horizontal PVC tubes are flawed and their design flies in the face of proven concepts, designs and practices used in the water treatment industry for several decades. Outside of the boating and RV community you won’t see PVC tube filters being used in any other industry (commercial or residential). If this design was superior or more efficient than the current (and proven) upright systems then you’d see industry giants like Culligan, US Filter, GE etc. adopting this concept. Truth be told, if you called any reputable professional water treatment company and asked them about horizontal PVC tubes, they’d laugh at you (and then probably hang up). Despite the PVC tubes all being virtually the same, companies tout themselves as the “industry standard”, “best system available” or some other bold claim to reinforce that they’re superior. If you’re going to spend your hard earned money on one of these please consider the following before buying. 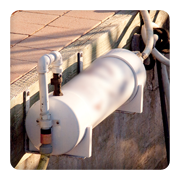 All water softening systems require freeboard. Freeboard is the empty space within the tank that’s necessary for proper regeneration of the resin. Freeboard allows the brine to effectively penetrate and separate the resin bed to flush away the contaminants the resin has trapped. PVC Tubes are packed solid meaning there is little or inadequate freeboard for proper regeneration. Softening systems need freeboard. Over time, the lack of freeboard will prevent the resin from being properly regenerated leading to reduced performance and premature failure. Over time, the resin bed in a horizontal tube will compact. All resin beds do this to some extent. This “settling” of the resin will create a gap on the top of the resin bed and tube. While you can call this “freeboard” the truth is it’s not. Horizontal tubes do not have an efficient water distribution method within the tube (no distributors or riser tubes). As water enters one end of the tube it will seek the path of least resistance (top of tube) so it can exit the other side as effortlessly as possible. Exactly how much water are these systems actually treating? Not as much as you would think. Horizontal tube filters are relatively cheap to make (why do you think so many companies offer them?). The PVC tubing used in these systems is not UV stable. No coat of wax or label will prevent the harsh effects of the sun and UV leading to the premature failure of this material. 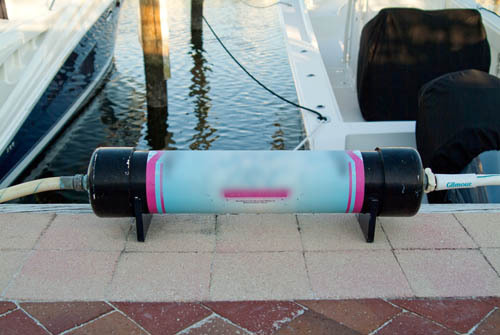 All too many times owners discover their resin bed spread across the dock or the ground because the tube failed. If your PVC tube breaks, good luck trying to repair it (and having it last). Some companies offer long term warranties but if you read the fine print, you only receive a credit towards the purchase or replacement of a new unit. Where is the value in spending more money on an inefficient system that didn’t last in the first place? Value? Some PVC tubes are upwards of $800 for a unit. That’s quite a bit of money for a PVC tube that can’t be serviced with a limited service life. Remember this is PVC that can be purchased at your local hardware or plumbing supply store for $1-$2 per foot. There are many more points we could discuss regarding the inefficiency and flawed design of these systems including channeling, claimed capacity and performance vs actual capacity and performance, appearance and quality of construction. If you’d like to learn more give us a call or email us your questions. If the first two facts listed above don’t convince you that these systems are not worth the investment, then ask yourself this. When was the last time you saw a horizontal PVC tube being used as a water softener behind your home or in an industrial environment? Answer is you haven’t and you probably never will.